I spent the last three years writing my PhD thesis. Since my thesis is about networks, I have used network datasets for research. Experimental results are more significant when done using multiple datasets and therefore I started collected network datasets. At first, I collected bipartite rating graphs such as MovieLens, Epinions and Netflix. Later I added social networks such as the Slashdot Zoo, Facebook and Flickr, hyperlink networks from Google, Wikipedia and TREC. Before my thesis was done, I noticed that I had collected over a hundred network datasets! My PhD thesis is about the spectral evolution model, but such a large collection of network datasets is much too interesting to use it just for that. Therefore, I decided to perform some statistics with the collection of network datasets, trying to reproduce well-known results about networks. One such result is that the density of networks is increasing over time. Let me explain that: A network such as Facebook consist of nodes and links. In the case of Facebook, the nodes are users and the links are friendship links. We cannot know the complete Facebook network, but a part of it is available for research. What’s great about this dataset: Not only do we know the friends of each users, we also know the date at which each friendship link was added. This allows us to look at the changes in the network over time. For instance, one important statistic in a network is the average number of links connected to each node. This number is called the network density. A well known result about networks that change over time is that their density is increasing. In other words, the average number of friends people have on Facebook gets larger over time. This is not a trivial property: When a new user account is created, the average number of friends goes down, because new users don’t have any friends. The result is: Network size and density do not correlate! In other words, the growing density is a feature of individual networks, not of networks as a whole. This kind of result is kind of straightforward taken individually, but is only made possible when using a large collection of datasets! Therefore, me and my colleagues at the Institute for Web Science and Technologies (WeST) at the University of Koblenz have decided to make the collection of datasets available in a form that makes it easy to do these kinds of studies. We will call the collection of datasets KONECT, short for Koblenz Network Collection. You can look at a poster of KONECT that we presented at the Web Science Conference that WeST organized in Koblenz a few weeks ago. We will also announce the KONECT web site soon—So stay tuned to this blog for more information! On the Spectral Evolution of Large Networks, Jérôme Kunegis, PhD thesis, University of Koblenz–Landau, 2011. This entry was posted in Uncategorized by kunegis. Bookmark the permalink. Interesting … I wonder why this is. I think we would expect that density would increase over time for many growth networks, but not all networks are growth related, so maybe there are a combination of a number of different networks. The other thing I would like to know is whether you were able to collect interconnections among users of each site (I am guessing not) – that’s a lacuna that might be providing the result you suggest. About your first comment: If by “growth network” you mean that only new edges can be added, then yes. In fact, the evolution of the average degree is a trade-off between adding new edges (which always increase the average degree) and added new nodes (which always decrease the average degree). About your second point: we don’t have links from one network to another in KONECT, although if we had them, we would consider the whole as a single network. But of course in the real world, all social networks are connected through the real-life persons, so any social network dataset is always only a subset of the real thing. Hi, did you look at any citation networks? If so, how does the density in citation networks behave? I was wondering if you can help me solve an issue with your expertise… I have to compare three networks of different size (50, 400 and 900 nodes, respectively). I would get very different network properties (for instance avg node degree)… What would you do to compare or to find relevant information (comparable) in those networks? What paper or reference should I look for? Long answer: These statistics are not really size-independent, and even if they were, they would not be enough statistics to really characterize a network. Currently I’m writing a paper about how to scale the statistics of a network such that it has another size. For instance, given a network, change its size to a given size N, and scale all its other statistics accordingly. The goal is to be able to compare the networks at the same size. And also if N is small enough, it is then possible to draw the graphs and compare them visually. What networks are you working on? thank you for posting such an interesting and beneficial article. Can you advise me How could we adapt the Maximum curvature concept into ‘finding the central node of a network’? 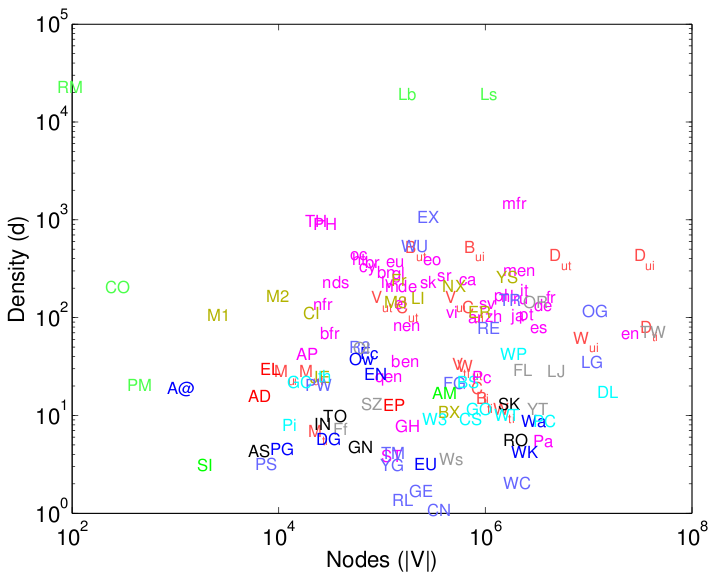 central nodes are the most influential or those with more connection than other nodes in the network. Centrality is a huge topic in network science, and dozens of measures for it exist. As for the maximum curvature concept, what is it?